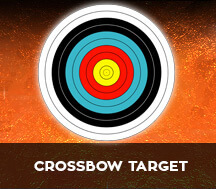 Welcome to our range of crossbows, crossbow bolts and Targets. 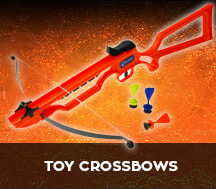 we price match anyone and offer free shipping on crossbows in the uk. We have most of the popular models and brands such as Anglo arms and armex. 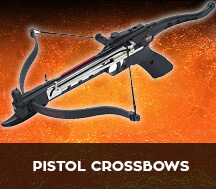 The most popular type of crossbow is the pistol type, and in this, we sell both the plastic type and aluminium crossbows. 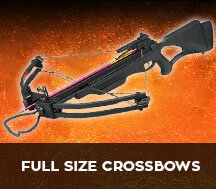 We also sell bigger full-size crossbows with some of them even coming with red dot scopes. 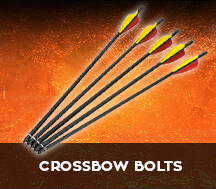 Mostly the crossbows are rated by they draw weight.The higher the draw Weight, The more powerful the crossbow will be. As you can imagine crossbows are pretty dangerous and deadly for hunting, so the sale of these is restricted 18'sYears old only. Our range includes crossbow kits for kids; that would class as toys and as such are completely safe for use by a younger person. 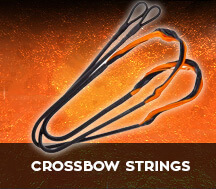 on the other end of the scale, we offer bows and crossbows that should be treated as a weapon. as they have the ability to seriously injure and even kill if misused - these are NOT toys and should never be given to a child to use unsupervised, this is not only a danger to anyone around but is also a threat to the child themselves. Anglo Arms Aluminium Pistol Crossbow Bolts 12 x 6.5"
Anglo Arms Plastic Pistol Crossbow Bolts 12 x 6.5"